Download Stock Quotes for Excel is practical tool you can update automatically through the Internet the stock quotes or market indexes into your Excel spreadsheets. No more manual and tedious updates or risk of using out of date data. 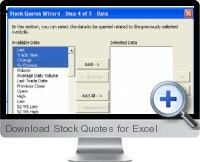 Download Stock Quotes for Excel is like any other Excel function. When the function is inserted in any cell or inside a formula, the add-in automatically refreshes the stock quotes or market indexes with the latest data. The add-in includes a wizard to help you to use the tool. There is also a 'Quick Fill' which allows to download current stock quotes from a complete range or list of symbols. An added calculator with tape shows the history of calculations. Additionally it includes different refreshing data options and reports with the stock quotes and market indices used. Note: The stock quotes and market indexes data is obtained from the MSN Money Central Investor web site (http://moneycentral.msn.com/investor/home.asp). The quotes are delayed by at least 20 minutes. Download 500, 1000, 10000 or 15000 or more quotes at a time. Download Stock Quotes by date. Link other web resources to Excel pages like: News, Fundamentals, Options, Charts, Calculators, Competitors, etc. for any quantity of symbols. Download historical prices and graphics of historic prices of daily, weekly and monthly action with the Data Downloader tool. Download financial data like Cash Flow, Balance Sheet, etc. Retrieve the company names by knowing the company symbols, or vice versa. Add multiple conditional formatting to Stock Quotes reports and observe the changes in the spreadsheet. Download Stock Quotes, Mutual Funds or Indexes in an integrated way. Configure the Refresh Settings tool to 10 minutes as minimum.